Lu Yi is a sound artist and a member of Soundwatch Studio. She obtained a master’s degree in Applied Arts from National Chiao Tung University, Taiwan. She did further study in San Francisco at the Academy of Art University and the San Francisco Art Institute. She began working in the sound art sphere in 2011 when she founded Soundwatch Studio with Fujui Wang, a pioneer of sound art in Taiwan. The two have performed live together at events and festivals including “Shoot The Pianist” (Birkbeck School of Arts, University of London), “On Site” (Taipei Artist Village), “B!as 2015: Taiwan-Belgium Sound Art Exchange Project / City Sonic 2015” (Mons, Belgium), Digital Art Festival 2015 “Digitopia” (Songshan Tobacco Factory, Taipei), “Ting Shuo Has Performance” (Ting Shuo Studio,Tainan), “Craked Sonic” (The Wall,Taipei) and Lacking Sound Festival “Listen 100” (The Wall,Taipei). Lu Yi also collaborates with a French visual artist Sébastien Labrunie under the name Sondes AV Duo. 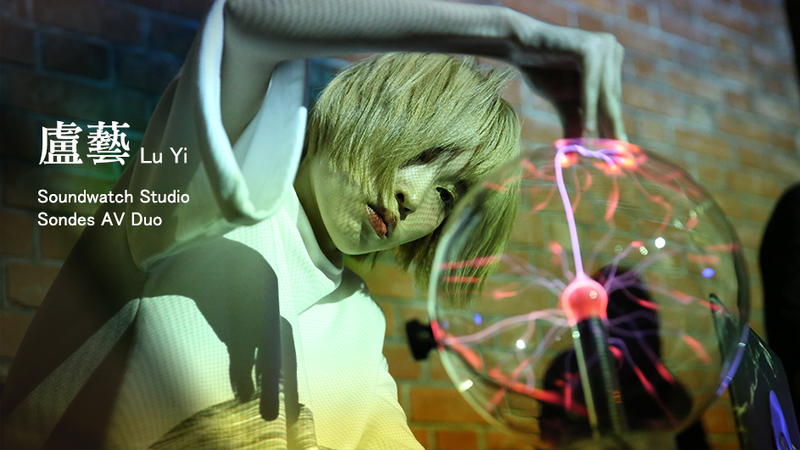 The two have presented a series of real-time interactive audio/visual performances at events including “Hypersonic 2016” (TNUA,Taipei), “Xue Xue Party night” (Xue Xue Institute, Taipei), Lacking Sound Festival “Listen 103” (The Wall, Taipei) “The Book Of Daughters” (Venue, Taipei), “Generate the Night” (Taipei Artist Village), “Pattern Calling” (National Theater & Concert Hall, Taipei) and “Electric Indigo” (Chiang Kai-shek Memorial Hall, Taipei). In addition, Lu Yi has drawn on her previous experience working in education to organize sound art workshops at several prestigious institutions, including The Taipei National University of the Arts, Museum of Contemporary Art Taipei, The National Taiwan Science Education Center and The Shiner Education Foundation. — “Becoming an electrictronic musician”, workshop series supported by The Shiner Education Foundation and presented from 2015 to 2017 at Wucheng Elementary School (Nantou), Liyu Elementary School (Nantou), Long-Hua Elementary School (Nantou), Sin-Siang Elementary School (Nantou), Renhe Elementary School(Nantou), RuiTian Elementary School(Nantou), YongKang Elementary School(Nantou), KwongYuan Elementary School(Taitung), WanTan Elementary School(Chiayi), Merrill Elementary School(Chiayi), TaoYuan Elementary School(Chiayi), HeShun Elementary School(Chiayi), Guangrong Elementary School(Chiayi), LiMing Elementary School(Chiayi), Wunhe Elementary School (Tainan), LongCi Elementary School (Tainan), Houbi Elementary School (Tainan), Jhupu Elementary School (Tainan), KunShen Elementary School(Tainan), Jia-Nan Elementary School(Tainan), Chong-Xi Elementary School(Tainan), ZhangShan Elementary School (Kaohsiung), HingChung Elementary School (Kaohsiung), TongAn Elementary School(Pingtung), Qiangyuan Elementary School(Pingtung), JianChing Elementary School(Hualien), Changqiao Elementary School(Hualien), LinRong Elementary School(Hualien).